The U.S. Food and Drug Administration (FDA) on June 21 issued guidance to industry to help prevent the inadvertent introduction of allergens or toxins into the United States food and feed supply. The guidance provides greater transparency by explaining how the agency will conduct its early safety evaluation of new proteins in new plant varieties, including bioengineered varieties, that are in development for possible use as food for humans or animals. 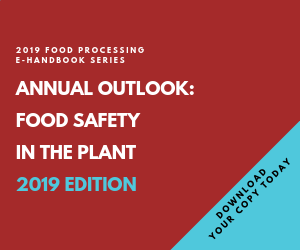 This guidance is focused on resolving any potential food safety issues prior to possible inadvertent introduction of material from a new plant variety for which FDA has not been consulted. FDA has not found, and does not believe, that new plant varieties under development for food and feed use generally pose any safety or regulatory concerns. The new guidance is consistent with FDA's policy of encouraging communication early in the development process for a new plant variety. FDA believes that, given the low levels at which material from new plant varieties under development could possibly enter the food supply, any resulting food or feed safety concern would involve the potential that a new protein could in some people cause an allergic reaction, or be a toxin in people or animals. To prevent such a remote possibility, this guidance describes the procedure for early food safety evaluation of new proteins in plant varieties prior to the stage of development where the new proteins might inadvertently enter the food supply. Under the guidance, entitled "Guidance for Industry: Recommendations for the Early Food Safety Evaluation of New Non-Pesticidal Proteins Produced by New Plant Varieties Intended for Food Use," developers would voluntarily provide FDA with information about the food safety of new proteins at a relatively early stage of development of the new crops. Following a decision to commercialize a particular crop, it is recommended that each developer participate in FDA's voluntary premarket consultation procedures. To date, all new biotechnology-developed plant varieties intended to be used for food and feed in the United States have completed these consultation procedures before they entered the market. The issuance of this guidance was proposed in August 2002 by the White House's Office of Science and Technology Policy as part of a series of federal actions involving also the Environmental Protection Agency and the United States Department of Agriculture. The purpose of these actions is to update field test requirements, and establish early voluntary food safety evaluations for new proteins produced by bioengineered plants. FDA published a draft guidance document for comment on November 24, 2004. Today's final guidance includes several clarifications suggested in the comments received in response to the draft guidance document. The full text of the guidance can be found online at: www.cfsan.fda.gov/~dms/guidance.html.